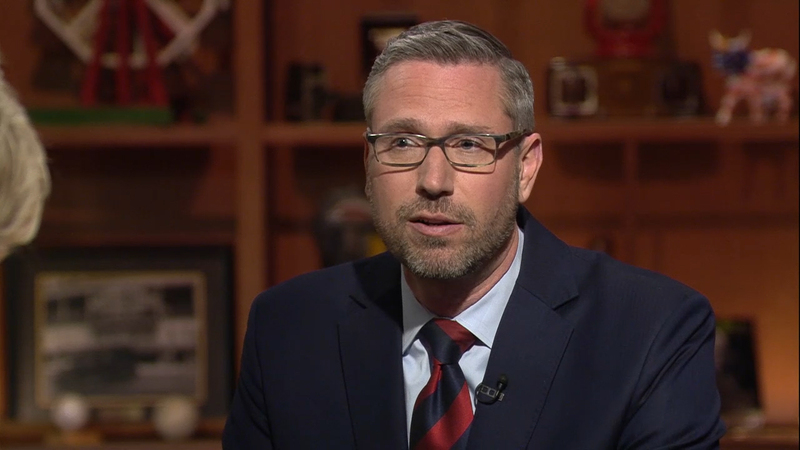 Illinois State Treasurer Michael Frerichs appears on “Chicago Tonight” on April 30, 2018. Wads of cash, stored and transferred in duffel bags, rather than deposited at the bank. It seems shady, the dealings of a criminal underworld, an unscrupulous way to operate a business, let alone appropriate for a state-authorized industry that so far this calendar year is edging toward $27 million in retail sales. But companies in the marijuana industry – including the cultivation centers and 55 dispensaries licensed by Illinois to grow and sell cannabis to the 57,837 patients approved through the state’s medical cannabis pilot program – have little choice. Banks won’t take them on as customers, for fear of persecution by the feds. Even though medical marijuana is legal in Illinois – and recreational cannabis is likely to be soon, given that it’s on Gov. J.B. Pritzker’s wish list – it’s classified by the federal government as Schedule 1 illegal drug. It defies logic and invites risk, Frerichs said at a press conference Monday. Frerichs backs legislation (House Bill 2980 and Senate Bill 2023) that would prohibit state regulators from penalizing a financial institute that works with a legitimate, state-approved cannabis-related business, in hopes that a guaranteed reprieve from punishment would spur participation from banks. Even so, bank deposits are federally insured, and there’s no indication that Washington, D.C., is ready to embrace legalizing marijuana. On the contrary, the sole Illinois bank that served the industry pulled out last May after an edict under President Donald Trump’s Department of Justice rescinded a policy outlined under President Barack Obama’s administration known as the Cole Memo, which largely protected marijuana-legal states from federal scrutiny. “Even if we can find a state bank that’s willing to offer a loan, issue a checking account, they still will largely be a cash-based business for some time,” Frerichs said, noting that businesses would not be able to take Visa, Mastercard or other major credit cards. Thus, pushing for change in Washington is the second plank of the plan. Frerichs said he’s working with officials in other states to pressure Congress to pass a law mirroring the one he’s advocating for in Illinois. With a majority of states permitting some form of legalized marijuana – 33 states and the District of Colombia by the treasurer’s office count – Frerichs said a collective push could be enough to spur Congress. “Because this is happening state by state by state by state, it’s the one thing that we think will make the federal government move,” said Sen. Toi Hutchinson, D-Olympia Fields, the sponsor of the Senate proposal and president of the National Conference of State Legislatures. Rep. Kelly Cassidy, D-Chicago, is sponsor of the House version of the bill. She’s also one of the legislators leading the charge on recreational cannabis.